james corenthal gets an unexpected visitor during a blizzard storm. an unexpected and inexplicable change in a situation or in someone’s behavior. this started as a crackish milo gets a " loving home au " that i was going to write like 250 words tops for it, and then it spiraled out of control until it was literally almost 1.5k and i had a full page in a google doc of world building. Chapter 1: > play side a: james corinthal. There wasn’t a day James Corenthal didn’t have a concerned thought ( or more ) about the many haunted children that he had crossed paths with during his lifetime. once a father- always a father, he once had mused. It was the coldest and snowiest winter of any iteration that James could remember. The poor space heater he had set up in his kitchen had been working practically twenty-four hours to keep the area even moderately warm. That evening there had been a blizzard warning issued for his area- which had left the man stranded in his quaint house for the next day or two. The knock on came a little after 11:40 in the night- around the time that the good doctor had been ready to expire for the evening. It was unusual to say the least. The knocking itself was persistent, desperate even- and growing more frantic by the second. By the time he had reached the door, the knocking had transitioned into a frenzied pounding against the sturdy oak. When James opened the door, the teenaged Milo Asher stood before him trembling and half frozen- backlit by the yellow street lamp that laid across the street from the house. “ Of course. ” James moves out of the way, allowing the teen to enter the house. once Milo had entered, the doctor locks the door back up- and ushers the teen to his kitchen. the amount of shivering and chattering that the boy was quite concerning. how far had Milo walked? the nearest train-station was at least a twenty minute drive from the house. Before turning away completely, something had caught the good doctor’s eye through the window. A person shaped absence of light ( almost like a shadow- except this shadow was casting a shadow onto the snow covered ground ), standing on the sidewalk, directly in front of the door. Milo waved a shaking hand at it through the glass, and gave a thumbs up. The thing waved back- before taking its leave, moving out of the view of both the doctor and the teen. Thoroughly baffled by what the hell had just transpired between between Milo and the figure outside James encouraged the teen to head back towards the kitchen, heading upstairs to grab one of Vincent’s old heavy duty blankets from the storage closet. ( He couldn’t ever really bring himself to get rid of it, but hey! At least it was going to find some use. ) He grabs the first aid kit from the closet as well, just in case the need arise for it. When James heads into the kitchen to check on his house guest- he finds Milo curled up on the linoleum floor next to the space heater, still shivering. Now that he can finally get a good look at Milo in the light, James’s stomach sinks. Simply put, the poor boy looked absolutely terrible . James can guess without error slim that the boy had contracted hypothermia from walking around exposed in the elements outside. “ Milo, I brought you a blanket. Why don’t you take a seat at the table and we’ll have a chat, alright? ” James announces his arrival to the teen, placing both the blanket and first aid kit on the table- he headed to the cooking area of the kitchen, preparing the coffee pot and grabbing a glass of water for the teen. Milo must take his gentle suggestion as an order- because he scramble up off the floor and nearly flinging himself into a chair at the table, wrapping himself in the blanket whilst James finished up preparing the coffee. Wordlessly, James sets the cup of water in front of the teen, before taking a seat opposite of him. The noise of the snowstorm, the running coffee pot and the space heater being the most prominent noises in the room. The teen across from him carefully examines the clear glass, before taking it into both of his hands. Milo sips at the lukewarm glass of water as James watches over him with a concerned expression. James took out a mug and begun to pour the coffee into it, glancing at Milo with some curiosity at the teen’s silence. There’s a brief pause before Milo answers chooses to him. James moves back to the spot he had previously occupied, and takes a sip of his own drink. Milo takes a deep breath- and begins telling the him tale of how he had ended up at the Corenthal home in Jersey. James’s grip tightens on the ceramic mug handle in his hands, as he stared into the coffee in it- silently listening to Milo’s tale of how it had escalated to the current moment. Though James had the distinct feeling that Milo was probably keeping some of the truth hidden- ) And while the good doctor had gleaned from the teen’s letters that Mrs. Asher was far from a kind or gentle mother ( or even- a decent mother ), he hadn’t quite known the extent of what Milo had been going through in that house. For the first time in a very long time , James felt truly angry at someone. And he knew, without a doubt, that Milo truly deserved better, and perhaps , he could do right by the teen. Milo nods and James stands up, motioning for the teen to follow him. Milo does, and grabs an overstuffed backpack on the way that James hadn’t noticed earlier. They both head through the main hallway, past the front door entrance ( and James doesn’t comment about the way Milo tenses up with fear as they pass the windows in that area ), and up the stairs. At the top- James points down the hallway, towards the spare room. Even as he turned away from the teen, stinging his eyes and a melancholic smile forced its way onto his face, and the kinder memories of his Mining Town Four played in his brain for the rest of the night. 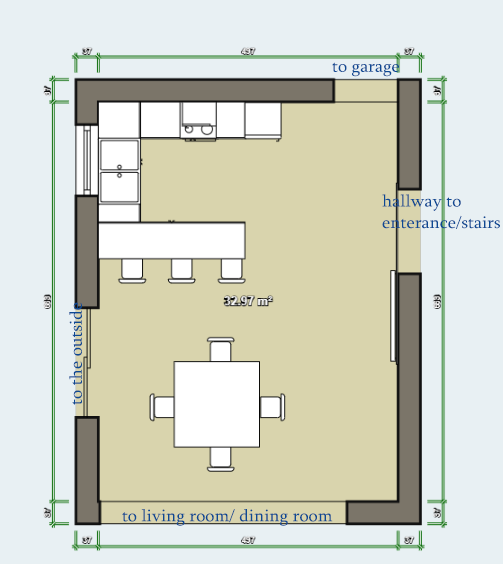 if you're curious- here's the floor plans for james's kitchen, for those who'd like a bit of visualization. also- you're more than welcome to guess who the figure walking with milo to is, even though i didn't tag him- bc technically his appearnce is more of a cameo. also- if there's any demand for it- i'll write up the milo companion chapter to this work! as always: my twitter is @stonefreed and my tumblr is @stone-freed ! i love when people as me questions about my aus, and you may even get exclusive drabbles and bonus artworks, along with sneak peaks ! so feel free to come and bug me!